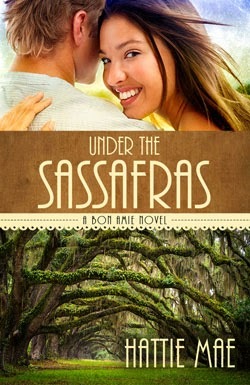 In Under the Sassafras by Hattie Mae, Joelette Benoit, a widowed mom of two engaging little boys, is eking out a living for her family by tapping the unique resources of the Louisiana bayous and swamps surrounding the quiet town of Bon Amie. She and her boys live outside of town with her mother-in-law, a healer of bayou inhabitants whether human, feathered or four-legged. After an abusive married life with her late husband, Jolette is determined to shield her heart, her independence and her boys. Then the boys discover an unconscious man partially submerged at the swamp’s edge. As he heals and struggles with memory loss, his wonder and appreciation of the bayou environment and the people who live there grows and earns him acceptance. Jolette finds it difficult to keep the barriers of her heart intact. The author creates strong characters and a story line that made it hard for me to turn out the light at night. I will read more by this author. I recommend Under the Sassafras if you like romance fiction. Sounds fascinating - especially the learning about somewhere new through the eyes of someone recovering from memory loss. It's on the list, which is getting ever longer.